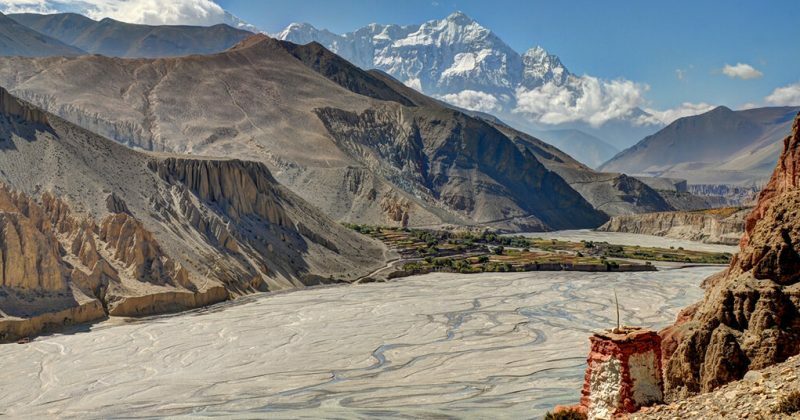 Upper Mustang trek is one of the best treks for those who want to experience the remote and untouched treasures of the Himalayas. The region between Manang and Dolpo in the north-central part of the country was opened to tourism only after 1992 due to its proximity to Tibet. Being the last place in Nepal to be ruled by a king and the restrictions imposed by the government have aptly given the region its name – The last forbidden kingdom. Mustang derives its name from the Tibetan word Mun Tan that translates to fertile plain. However, the rain-shadow area of the Annapurna massif and Dhaulagiri range has turned the land into a barren desert. This land of contradiction is hence also known as the mountain desert. The isolation has resulted in a settlement with cultures, customs, and lifestyles still unaffected by the modern world. You can experience the authentic Nepali-Tibetan infused cultures along with heritages and biodiversity. We encounter rice, wheat, barley, potato and other fields in the arid land of the Tamang, Gurung, Mustangi and Tibetan inhabitants. 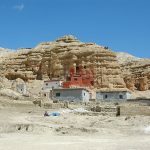 Upper Mustang is a barren landscape of eroded sandstone pillars and moraine terraces that form a colorful mosaic of yellow, red, and browns. The destination warms your soul with the hearty welcome from the Buddhists who inhabit this other-worldly place. Day 03: Kathmandu – Pokhara. Day 04: Pokhara – Jomsom – Kagbeni. Day 08: Tsarang – Lo Manthang. 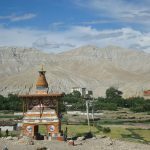 Day 09: Explore Lo Manthang. Day 10: Trek from Lo Manthang – Tsarang. Day 11: Tsarang – Syangboche. Day 12: Syangboche – Chuksang. Day 13: Chuksang – Kagbeni. Day 14: Kagbeni – Jomsom. Day 15: Jomsom – Pokhara. This is the day you enter the beautiful Himalayan nation of Nepal. You will be welcomed by one of our representatives and transferred from Tribhuvan International airport to your hotel. You can relax and enjoy Nepali cuisine. You spend the night in Kathmandu at an elevation of 1350 meters. We will take a tour of the beautiful, cultural city of Kathmandu. The sightseeing includes 7 UNESCO enlisted world heritage sites. We will visit Pashupatinath temple, Swoyambhunath stupa, Boudhanath stupa, Changu Narayan Temple, Kathmandu Durbar Square, Patan Durbar Square, and Bhaktapur Durbar Square. Once we explore the beautiful destinations, we can shop for gear and other items for the trek.Collect special permits and brief about trekking start next day. We spend the night in Kathmandu. The trip officially begins from the capital city, Kathmandu. We can drive for 6-7 hours or take a 30-minute flight to Pokhara. 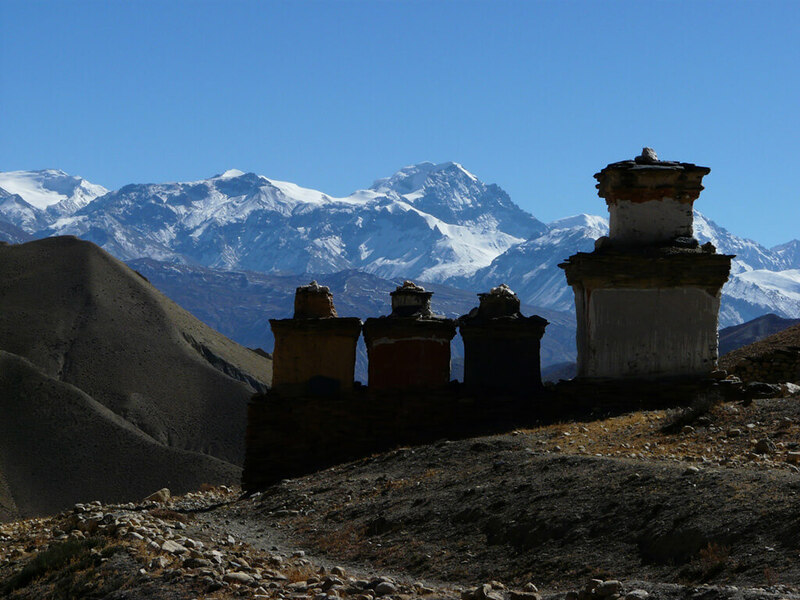 We are blessed with the magnificent views of Dhaulagiri, Fishtail, Annapurna, and others in the region. 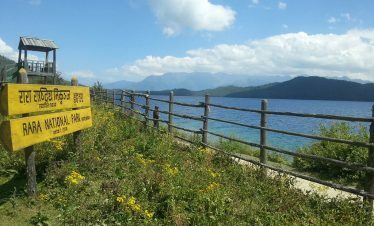 After some rest, we can go boating or stroll around the beautiful lakeside area of Phewa Lake. We spend the night at an elevation of 850 meters. On this day, we will take an early morning flight to Jomsom at an elevation of 2713 meters. It is a valley famous for its quaint look, apples, and windy weather during the afternoon. From here, we make our way along a beautiful valley till we reach Ekle Bhatti. As we keep going further, we finally reach Kagbeni situated at the confluence of Jhong Khola and Kali Gandaki River. It is a beautiful village with its unique settlements of flat-roofed houses. We spend the night at an elevation of 2810 meters. We need to get our permits checked to trek further than Kagbeni. After that, we begin our day’s journey along the banks of Kali Gandaki River. After ascending a hill, we reach the Tangbe village with narrow alleyways, white-washed houses, fields, and apple orchards. After passing through another village, crossing a river and a ridge, we reach Chele village. We spend the night at an elevation of 3050m. 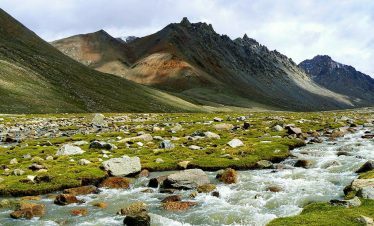 This day’s trek is comparatively more difficult as we need to cross two passes throughout the day- Taklam la pass (3624) and Dajori La pass (3735 m). We enjoy the views of Tilicho, Yakawa Kang, and Damodar danda and also visit the Ramchung cave. We descend for a while to reach Samar village and walk on a trail above the village to cross a ridge. Then, we descend a steep path to a stream to finally reach Syangboche. We spend the night at an elevation of 3475 meters. 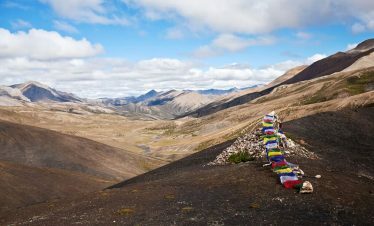 This day is another long trek as we pass through Yamda La pass and then some Tibetan villages with traditional houses and chortens. Then, we cross Nyi la pass, the highest point of the trek at 4010 meters. From here, we descend to the village of Ghami. We cross Ghami khola and pass through Mani walls with prayer flags. From here, we reach Tsarang after an easy walk to the east. We spend the night at an elevation of 3570 meters. From Tsarang, we first descend to a canyon and cross a river before beginning our uphill climb to Lo La Pass at 3950 meters. After admiring the beautiful village from the top of the pass, we descend to Lo Manthang. 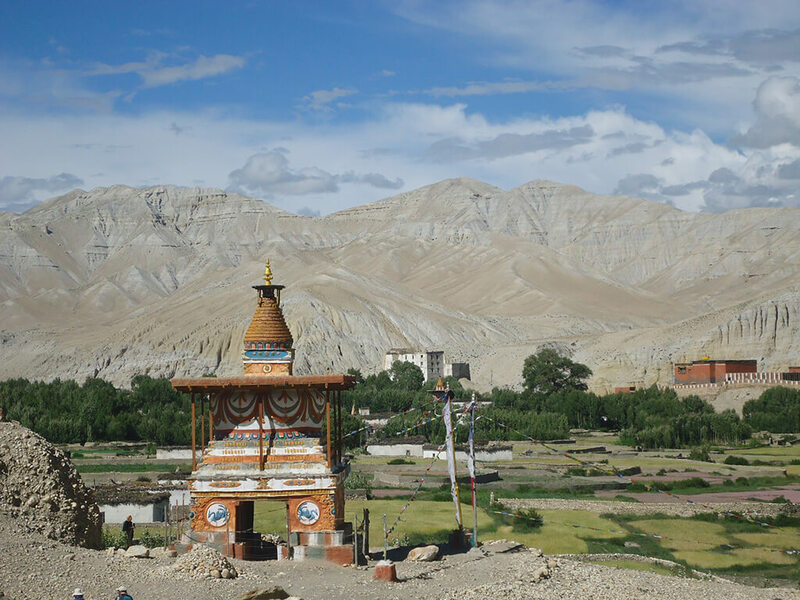 Lo Manthang is a beautiful walled village with the spectacular views of Nilgiri, Tilicho, Annapurna, and Bhrikuti peak as well as Damodar pond. We spend the night at an elevation of 3730 meters. We take a rest day to acclimatize to the higher elevations. 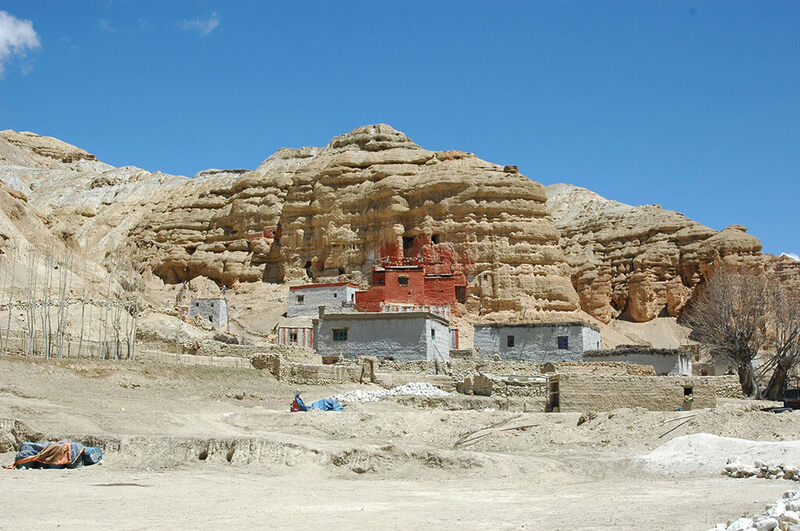 We also get a chance to explore the quaint, walled village of Upper Mustang valley. The highlight of the day is the visit to the three Gompas. We will explore Jhampa, Thupchen, and Chhoeda with the extensive restorations over the last two decades. If you want to explore more, there is a village to the north called Tingkhar. We return back to Lo Manthang and spend the night here. From Lo Manthang, we retrace our steps to Tsarang and spend the night at an elevation of 3570 meters. Again, we trace our steps back to Syangboche from Tsarang and spend the night at an elevation of 3475 meters. From Syangboche, there are gentle paths with a few ascents and descents. We walk along the river as we cross the desert like terrain. We come across streams and then cross Kali Gandaki river to finally reach Chuksang. We spend the night at an elevation of 3022 meters. After trekking for a while, we leave Mustang trail to join Annapurna circuit trail again. We reach Kagbeni after a while where we spend the night at 2800 meters. 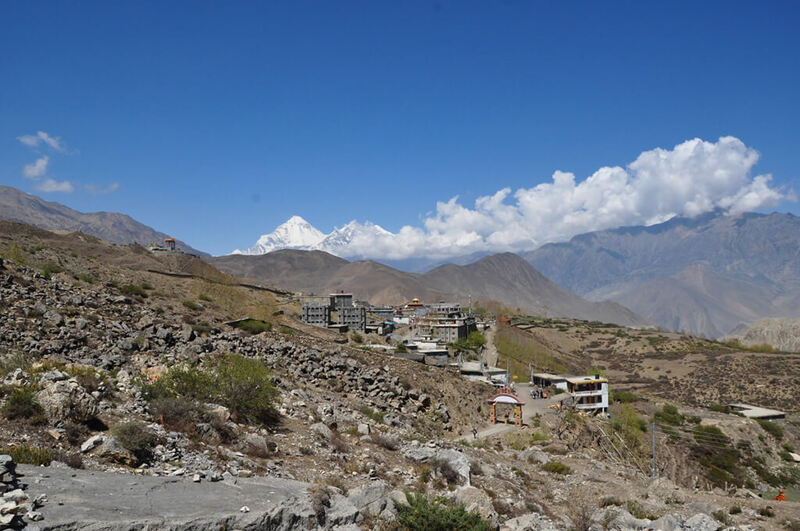 We trace our steps back to Jomsom where the trek finally ends at an elevation of 2710 meters. We fly from Jomsom to Pokhara with small aircraft, within 30 minutes we reach Pokhara with its beauty and serenity. We go boating and enjoy the nightlife of the lakeside area. After breakfast, drive to tourist bus park from the hotel, takes 7 hours to reach in Kathmandu, last night enjoy at Thamel tourist hub. Drive to Kathmandu airport for final departure to home. Deluxe Accommodation in Pokhara O/N BB basis for two night. Food while in Kathmandu and Pokhara. When is the best time to visit the Himalayan regions? 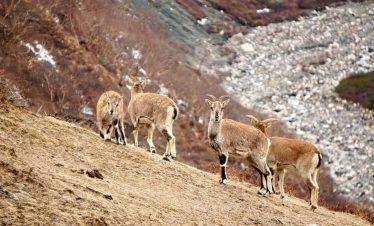 Depending on what you plan to do, the Himalayan regions are accessible throughout the year although some periods are more suited to certain activities. Nepal has a typical monsoon 2 season year. The dry season is from October to May and the wet season or monsoon from June to September. The best time to trek is from October to May, with the first two months of the dry season (October and November) being the ideal period for trekking in Nepal. The air, freshly washed by the monsoon rains, is crystal clear, the mountain scenery is superb and the weather is still comfortably warm. December, January and February are still good months to travel but the cold can be bitter at high altitudes. March and May offer better weather when trekkers can see superb wild flowers, particularly in Nepal’s wonderful rhododendron forests. Towards the end of April and beyond, building up to the monsoon, it can start to get quite hot and at times uncomfortable. May and June are very hot and dusty and can be uncomfortable for anyone not used to this type of climate – and for those who are. The monsoon arrives mid June to September with heavy rains and cloud. It usually rains every day but not all day. 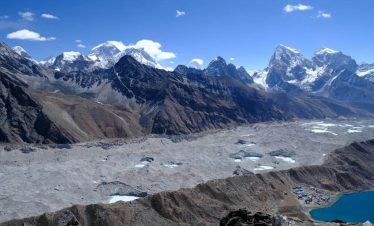 Whilst some treks are still possible it is not the best time to visit for trekking or travelling around and plans can be disrupted according to weather conditions. At the end of the monsoon (August and September) there are lots of interesting and lively festivals. Where is the best place for going trekking in Nepal? The himalayas of Nepal offers various options that vary in difficulty, length, budget and trek style. Ultimately, each and every kind of trekking trip will be one of your life time most rewarding experience. There are a various number of treks which are famous for its uniqueness, natural beauty, and difficulty. As Nepal is not only home for high mountains but also it has never ending diversified culture and geography. If you have enough time, then the Everest Base Camp and the Annapurna Circuit are the best trekking trail of Nepal. Besides this, there are a number of trails all around the country. If you have limited time, you can trek to Langtang-Helambu region which is very close to Kathmandu valley or also any parts of Annapurna region which is north of Pokhara. Restricted trekking areas such as Manaslu region, Mustang region and Dolpo region are also another famous trekking trail of Nepal. These beaten trekking trails provide you an adventurous experience into the wilderness. All these treks offer you a breathtaking snow-capped mountain views and close up view of local culture, traditions, and lifestyle of the mountain people. How difficult are the trekking routes of Nepal? Trekking in Nepal is a popular and thrilling walking adventure across the world. There are hundreds of trekking trails in Nepal some of them are easy, moderate, challenging and strenuous. Difficulty of trekking level depend on the level of terrain, length of walk, condition of trekking trails, weather conditions and physical fitness required for the trek. The shorter trek tends to be easier while the longer ones require physical fitness. Yes of course you will be travelling through uneven rough surfaces or steep trails so you need to be prepared. So, if you are reasonably fit, then trekking is challenging but not exhausting. For sure, our company has designed trekking package in a way that you can walk comfortably long distance each day. To a large extent this depends on when you visit and where you intend to go. For example, during the winter if you are in the southern Terai region a tshirt will suffice. At the same time in Kathmandu you’d need a jacket and at Everest Base Camp you’d need to be very well wrapped up. Kathmandu Valley’s daytime weather is very pleasant throughout the year although it can get chilly during the day in winter and the temperature can drop considerably after sunset although never below freezing. The most you will need is a warm sweater or jacket. On the Valley edge and at higher altitudes it will be much colder. During the monsoon you’ll need an umbrella or light rain jacket. For treks, good sunglasses, a hat and sunscreen are necessary. For trekking you’ll also need good quality (preferably broken in) trekking boots and if you’re going on safari, we recommend you wear natural coloured clothes to blend in with your surroundings. Clothing is easily and cheaply available in Kathmandu, including tailor made items so it’s rarely a problem if you forget to pack something. When you make a booking we’ll send you a list of recommended items to bring and we’re always happy to respond to any queries you might have or to help you find the items you need in Kathmandu. What’s the currency and will I be able to change money easily? What sort of trekking routes does Nepal offer? Nepal undoubtedly offers some of the most spectacular and beautiful scenery in the world, with well published photographs of Everest, Machhapuchhre, Ama Dablam and other huge mountains making them instantly recognizable to keen trekkers from every continent. Nepal has a virtual monopoly on the world’s tallest mountains (eight of the fourteen highest peaks are located in Nepal) and a number of the popular trekking routes offer wonderful views or visits to base camps used by mountaineering expeditions. The lower hill country is also often breathtakingly beautiful with pretty villages, attractive houses and interesting temples as well as subtropical lowlands, vast meadows and forests, fast flowing rivers, deep canyons and the cold and barren regions at the feet of the great mountain peaks. The views change with the seasons, with different stages of planting and harvesting cycles in the villages and valleys and the brilliant display of wild flowers in spring and autumn. What happens when I arrive in Kathmandu? We will meet you at the airport and transfer you to your accommodation. We will then organise a pre-trek or activity briefings, free of cost either in our office in Kathmandu or at local hotels or guesthouses according to what is most convenient to you. During the pre trek briefings we provide information on the following as well as provide opportunity for you to ask any remaining questions or additional requirements: well prepared day by day itineraries of the trek or activity you have booked. The number of hours you can expect to walk each day and the type of terrain and number of consecutive days walking; the gradual height gain and minimum and maximum effects of altitude; the availability of some trekking equipment from us and other items necessary to hire from a local shop. Conserving the environment and behaviour towards all people; direct dealing with our local tourist buses, domestic and international airlines; visa and special trekking permits for the restricted regions of Nepal; suggested clothing list. Are there different styles of trekking? There are 2 main styles of trekking –teahouse trekking and camping style trekking. On the more popular trek routes in Nepal, enterprising villagers have built tea-house lodges. They are most readily available in the Everest, Langtang and Annapurna regions. Teahouses are like small guest houses. We offer a selection of tea house treks run to a high level of service. The other style of trekking is camping. The trek is staffed by a full Sherpa crew including a Sirdar (headman), cook and assistants. Porters with yaks, horses or mules carry your main baggage. It is the Sherpa’s job to perform all the camp work including leaving the sites clean and to guide you on the route. Food on camping style treks is a mixture of Asian and Western dishes with plenty of choice and 3 main meals as well as tea and coffee breaks each day. On a few of our teahouse treks the crossing of high passes necessitates camping for a couple of nights. We provide full camping services for these nights, including four season sleeping bags. What is involved in a typical trekking day? Normally, your day on tea house trekking will starts around 6:30-7:00 am. In the morning, after having breakfast you will start the day’s hike. Along hiking 3-4 hours we stop for lunch in midday 12:30-1:00 pm and after you will again continue the hike. Generally, the hiking after lunch will be shorter and rest of the afternoon can be spent the exploring the village or simply relaxing with reading book or rest. Around 7:00-8:00 pm your dinner will be served and rest to bed. What facilities should I expect at overnight stays? In the Kathmandu valley or Pokhara city you will stayed in hotels of your preferences. We have a number of hotels that range from luxury deluxe to budget hotels. While on trek, accommodation will depend on the trek style. If you are deciding for a camping trek, then you have to spend your nights on tents. If you are trekking in most popular trekking trail such as Everest, Annapurna, and Langtang region then well-established tea houses will provide sleeping accommodation. Most of the tea houses provide the solar showers and clean western style toilet facilities. However, if you are travelling in more remote areas, the accommodation facilities are more basic as they might have limited options for private rooms. All tea houses will provide you boiled water. And on the trek, your guide will provide water and ensure that water is boiled and treat it with iodine or water purifying tablets. Iodine is 100% effective in killing the bacteria in the water. We discourage the purchase of bottled water while on trek. As the plastic bottles are difficult to dispose of that might become an environmental problem. Trekking poles will help you, especially on treks with long ascents and descents. If you have any knees or ankle problem, this will really help you as it reduce the impact of your body weight on your knees, ankles and feet when you are going downhill. It will also help you to maintain balance in difficult terrain such as during river crossings or on a slippery, muddy terrain. Finally, staying balanced helps you move more quickly and easily. What kind of trekking boots do I need? You need to select the right types of shoes depending upon the duration of the trek, trail conditions (well-defined trail, rugged trail, rain, and snow) and the load to carry. For warm and dry terrain you can use low-ankle hiking shoes as they are lightweight with flexible shoes. They are meant for short treks and these shoes are good if you don't have to carry heavy loads. For cold and rugged conditions you can go for trek boots as they have added support for your ankles and feet. These kind of boots are ideal for the long trek and involve carrying heavy loads. These boots are good on snow and rain. Trekking on the glacier and extensive snow will require trek boots which have thick and more aggressive outsoles. These kind of boots are for challenging treks which last for longer period. They also have better ankle support and come with crampon-ready features. What is the best clothing and equipment for hot weather? Trekking in Nepal can be heaven if you are suitably dressed and hell if you are not. This applies in all weather conditions, but especially important in hot weather. For hot weather trekking, you need to wear loose fitting and light weighting clothes made with quick drying fabric. While trekking, you may deal with the sun, so you need to be fully covered. Hence, long sleeves are recommended. You need to carry with yourself a wide brimmed sun hat, high UV protected sunglasses, high SPF sunscreen and insect repellent. What is the best clothing and equipment for cold weather? For cold weather, several thin layers are more effective than just one or two thick layers. To fight with the chill wind, a windproof jacket can be used as the outer layer. Here are some of the best down jacket of 2017 that you should take a look at. They are lightweight and warm. You can wear thermals as base layer and fabrics must wick sweat away from your skin to avoid getting wet and cold. In addition to this, you need to protect your hand and feet with high-quality thermal gloves and socks. And also wollen hat to protect your head and scarf to protect your face and nose from the cold wind. Can I charge my electronic devices on the trek? Most of the tea houses on the popular trekking trail have electricity, but in some remote area may not have a 24hour electricity. Please make sure that your gear is fully charged at the start of the trip and pack a portable power back. And turn your phone to flight mode to save power. As in some remote village, if you do charge up any your electronic device from village electronic supplies then they demand small contribution. What type of insurance should I have? Where can I obtain the insurance? You need to obtain normal travel insurance and it must cover personal injury, medical expenses, and accident. If you are traveling to high altitude regions, then it is best to insure for rescue and evacuation operation. In an emergency case like natural calamities, you will need immediate evacuation usually by helicopter. There are many travel insurance companies that offer insurance package to tourists. But, you can get it in your home country also. The cost and coverage will be as per the insurance amount and your age. Is it possible to do side trip before and after trekking in Nepal? Yes, of course, if you have enough time you can extend your days you can do side trip before or after trekking in Nepal. You can go for Chitwan wild jungle safari, Kathmandu Heritage site visit, rafting, sightseeing in lake city Pokhara and much more what we have in Nepal. Were the trekking routes of Nepal are damaged by earthquake 2015? Not all of the trekking regions of Nepal are damaged by earthquake 2015. Some of the trekking regions easily escaped the earthquake without a single scratch. The popular trekking regions like Annapurna, Lower and Upper Mustang, Dolpo, Makalu, Kanchenjunga, Dhaulagiri escaped the widespread damage. The famous Annapurna region has been untouched by the earthquake so you can plan your trip to the beautiful city of Lake Pokhara and even trekking the Annapurna trails. What essentials documents do I need to bring with me? You must bring a valid passport (extra photocopy and must be valid for up to 6 months), a copy of your travel insurance, flight tickets, emergency contact numbers, medication (if any), and cash. Is there any banking facilities are available at the mountain region of Nepal? Nepal has adequate banking facilities having a number of branches in every corner of the country. Almost all foreign currency along with credit card is broadly accepted. ATM is widely available in Kathmandu, Pokhara and some bigger town on treks. But when you will travel to the remote area, you have to carry enough cash. As some trekking area has ATM and bank but they may not be reliable. What is the weight limit for luggage or equipment that we can take? The weight limit for the trek is 15kg per trekker, as it is the maximum weight that the porters can carry. You need to take soft duffel bags instead of hard luggage as it may pose a problem. There are many advantages to using a guide during your trek. Our guides will make your trek easier and often cheaper by negotiating on your behalf for food and accommodation during the trek, they will show you places of cultural interest, they will make all arrangements with lodge owners for your comfort and privacy. 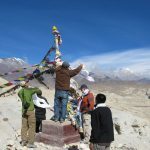 We use professionally trained and experienced local Sherpa guides or Sirdars on our treks and tours and are totally confident in their ability and experience in leading these routes. Local guides are integral to providing you with the best travel experience and using local guides means that not only do you benefit from their local knowledge during your trek and gain a real insight into local culture. Your travel is also directly supporting local people and employment and giving something back to local communities at the same time as you enjoy travelling. How long will I be walking for each day? A trekking trip can be any length you choose. 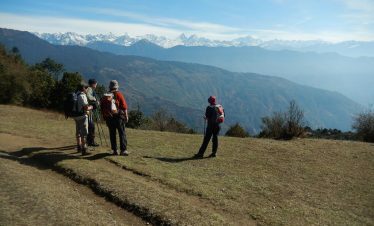 Popular short treks taking only one, two or three days to complete are available around the Kathmandu and Pokhara Valleys. Longer treks can last from a week to a month. It is even possible to combine a series of treks together and walk for months on end. A typical day’s walk lasts from five to seven hours. An average day’s walking is around 5-8 hours per day, including a stop for lunch en route. During the trek group members often string out with the faster walkers arriving in camp perhaps an hour or so before the last to arrive. Everyone walks at their own pace and stops when they feel like it – it’s about enjoying the walk and the beautiful surroundings. There are always local staff ensuring no one gets lost or into difficulty. Treks can also be tailored to be of shorter or longer duration. What are the paths and road like? Trails are well maintained and many trails up steep slopes are paved with stones. Trekking in Nepal involves walking up and down countless times rather than taking direct routes. Most treks go through areas of between 1000-3000m although the Everest Base Camp trek and the Annapurna Circuit trek, the most popular trek routes, reach over 5000m. Walking normally starts in the foothills and cultivated terrace areas with paths following age old trading and communications routes through deep gorges, forests, lush valley floors, across rivers by suspension bridge and perhaps wading across streams, over high passes from one region to another, connecting villages and monasteries and communities. More strenuous treks may cross glaciers and snow covered passes, depending on the route. You carry only what you need during the day, for example a daypack with your camera, water bottle, anorak or sweater, sunglasses and anything you think you might need whilst walking. Your main baggage is carried by porters, mules, yaks or horses. What is the best way to get fit for a trek? For trekking in Nepal, you should be moderately fit. You can do some regular cardio exercise like running, jogging and walking. Before heading towards trekking, you can do some physical challenging activities like hiking, biking, cycling, and swimming. This will also help you to prepare for your trekking trip. The simple answer is no. Although you should be fit enough to feel comfortable walking for several hours each day and with no serious medical complaints. If you do have any medical or health complaints we recommend you speak to your doctor and take medical advice before booking your travel. We also recommend you check your insurance is appropriate for your medical or health complaints as well as travel arrangements. Is trekking only for young people? Not at all. Trekking is for all ages. 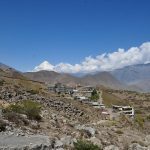 If you have an interest in the landscape and scenery, the wildlife and birdlife or simply want to get away from the hustle and bustle back home then trekking is for you. All that’s required is an interest and an ability to walk at a comfortable pace. There is a choice of Western and Asian food dishes or a mixture of both in all the destinations we visit. During a trek you can expect 3 full meals a day as well as regular tea and coffee breaks. On both our fully provisioned camping style treks and our teahouse style treks, where food is freshly prepared daily. During our teahouse treks, we offer a selection of teahouses, all run to a high standard by local people familiar with catering to varying tastes and requirements. You will be able to sample a wide range of dishes, all hygienically and professionally prepared to a high standard. We are also familiar with providing interesting vegetarian meals and are able to adjust dishes to meet your requirements, for example making Asian dishes less spicy for children. In the centres we visit, for example in Kathmandu, you will be able to choose between a wide range of restaurants, cafes and bars, offering both simple and sophisticated dishes to meet your tastes. Is trekking suitable for small children or families? Yes. Many of the most popular treks can be accomplished with young children and provide an educational, fun and safe environment for children of ages 6 and above with just a little more preparation and some modification. We also offer specialised trekking for families travelling with children and we can provide the following services: modified itineraries with shorter daily distances than normal treks; food prepared with less spice; laundry services; nursing service and massage specialists. We will work with you to ensure a family adventure that both you and your children will enjoy. What can I expect on a fully organised (camping) trek? The day starts early when you’ll be woken with a cup of tea or coffee from one of your Sherpa crew, who’ll also provide you with a bowl of hot water for washing. Once you’re up breakfast of porridge, eggs, bread, pancakes, tea and coffee is served. While you’re enjoying your breakfast and the local views, your Sherpa crew will take down the tents, tidy up the camp and pack up the loads for the porters. The entire group is usually on the trail by 7am to take advantage of the cool morning to accomplish most of the day’s trek. The porters are slower and the Sherpas, especially the cooking crew, race ahead to prepare lunch for when you arrive. The afternoon walk is usually short, lasting 3 or 4 hours at most. Tents are put up well before sunset and soon afterwards dinner is served. This is a more elaborate meal consisting of hot soup and a main meal (a variety of Nepalese, Chinese and Continental cuisines) rounded off with dessert and a cup of tea or coffee. Then an early bedtime and a good sleep, ready for the following morning. I'm going on a jungle safari. What should I bring? We recommend you bring the following on safari: binoculars, swim wear, flash-light, sun-hat and sun-protection cream, insect repellent, comfortable walking shoes, casual clothing. During winter months (from November to February) sweaters and jackets are necessary in the mornings and evenings. We also suggest that the colour of your clothes should blend in with the natural surroundings. What’s included in the cost of my trek? All Teahouse style treks include: Pick up from airport and transfer to accommodation, 1-2 nights accommodation in Kathmandu before and after your trek on bed and breakfast basis, guided sightseeing in Kathmandu with an English speaking guide. All entrance fees and permits for sites visited, National Park entrance fees, Royalty fees (eg Upper Mustang region), transportation to and from trek, accommodation in best available lodges during trek, 3 meals per day provided from the menu, an English speaking guide and the required porter(s) during your trek, essential equipment, sleeping bag, jacket, rain poncho etc, safe drinking water, first aid kits and emergency care service. All Camping style treks include the same as listed above for teahouse style treks with the following differences: Essential equipment, tents, liners, sleeping bag, jacket, rain poncho etc, twin share tented accommodation with separate dining, cooking, sleeping and toilet tents, 3 meals per day prepared fresh from the kitchen, an English speaking guide and the required Sherpa crew of guide/Sirdar, porters, cook, kitchen assistant, camping sherpas. Contact us for details of what is and isn’t included before you book. What’s not included in the cost of my trek? Items which are not included in the cost of your trek or trip are: Private bus, car or jeep rental to any destination on the trek, bar bills, bottled water, desserts, personal expenses or souvenirs, personal clothes, food or snacks during transfer journeys, tips, alternative transportation (eg car/air) in case of heavy rainfall, landslide, strike or road blockage, laundry, optional trips and activities, visa fees, travel insurance, international flights, airport departure taxes, excess baggage charges. Will I meet local people? 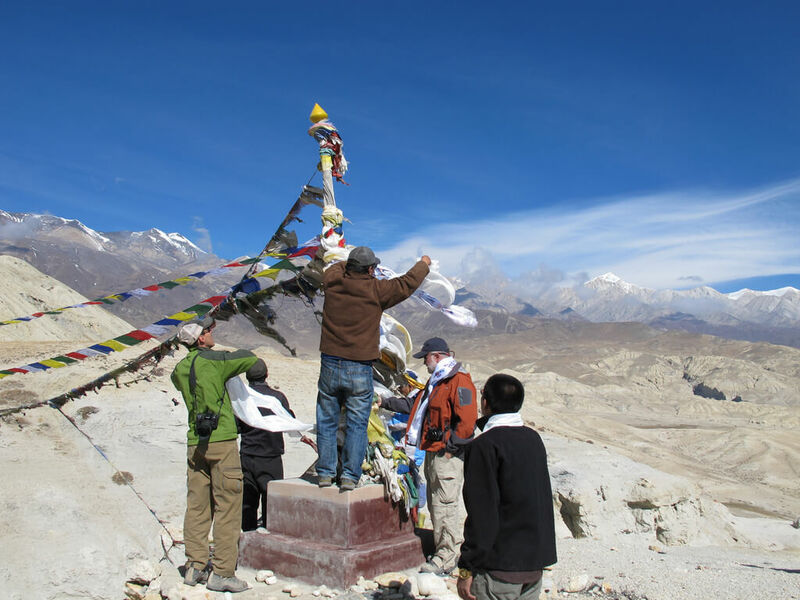 All treks are led by experienced and professional Sherpa guides and (for camping treks) crews. Your guide is there to act as a leader and local expert who will be able to help with any problems to ensure you a safe and enjoyable experience. Additionally, on our remote treks, your guide will carry a Very High Frequency (VHF) telephone or high speed satellite phone, for use in medical or emergency situations only. Why do we need acclimatization days? What is altitude sickness and how might it affect me? Altitude sickness, also known as Acute Mountain Sickness (AMS), is the major concern on high altitude treks and if not treated when symptoms first appear, can result in death. AMS is the effect of lack of oxygen at high levels on those who ascend too rapidly to elevations of 3000m or above. High altitude affects most people to some extent. Early stages of mountain sickness include headaches, dizziness, loss of appetite and difficulty sleeping. Being young, em and fit doesn’t necessarily help as different people react differently to the effects of high altitude. Medicine is no substitute for a hurried descent or evacuation to Medicine is no substitute for a hurried descent or evacuation to lower altitude. If a doctor is available he may give medicine and oxygen but the patient must go down to lower altitudes even if treated. For travel in the Khumbu region, you can contact hospitals in Khunde and Pheriche and for travel in Manang, Manang hospital can be contacted. Doctors are available throughout the trekking season. For travel in the Khumbu region, you can contact hospitals in Khunde and Pheriche and for travel in Manang, Manang hospital can be contacted. Doctors are available throughout the trekking season. What if I need to be rescued? If an unfortunate incident occurs such as flight delays, illness and bad weather on any part of the trekking route and rescue evacuation is required, our well trained and experienced guides will provide every assistance to you. We coordinate our service with a recognised private helicopter company and the Royal Nepalese army in the case of emergency rescue. We also register every trekker name with the appropriate Diplomatic Missions, Embassies and Consulates and have easy access to high speed and satellite telephones to ensure prompt rescue services. What’s the difference between climbing a trekking peak and trekking? How can I contact friends and family? There are now lots of internet cafes offering good service at good rates particularly in Kathmandu and Pokhara. Outside these areas and where available, connections can be slow and relatively expensive. The telephone system is good and it’s easy to make local, national STD and international calls as well as reverse charge (collect) calls to the UK, USA, Canada and Japan. There are also many private call centres offering cheap calls. The international country code for Nepal is 977. For outgoing international calls from Nepal the access number is 00 then the country code then the number. What about tipping and bargaining? Tipping is common and in most cases expected in Kathmandu. In top range hotels and restaurants a good guideline is to tip around 10%. In smaller places some small change is fine. Taxi drivers don’t expect to be tipped. Bargaining is common place in many but not all cases and should be an enjoyable part of the transaction. Try to find out a fair price and remember the cost to you of a few rupees may be much less than the value to a local person. Standard food, accommodation and entry charges should be respected as well as following the going local rates for services. What’s important about Responsible Tourism? We care deeply about the places we visit and the people who live there and believe that tourism should and can be something positive for both the visitors and the local communities.. Being responsible and protecting the environment does not mean a compromise in quality or standards of travel. Since our establishment, we continue to do what we can through our approaches and activities in playing an active role in the effort to minimize the negative impact of tourism and to raise awareness of eco and responsible approaches to tourism, both with travellers and local people. 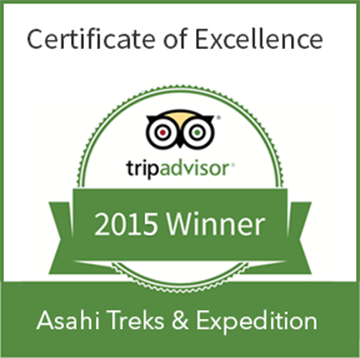 How does Asahi Treks support local development? We believe that travel and tourism should benefit local communities and can be a powerful support and catalyst for change. Asahi Treks supports local development in Nepal in a number of ways, including donating a percentage of profits to specific charities and working with local communities and businesses. Contact us to learn more.